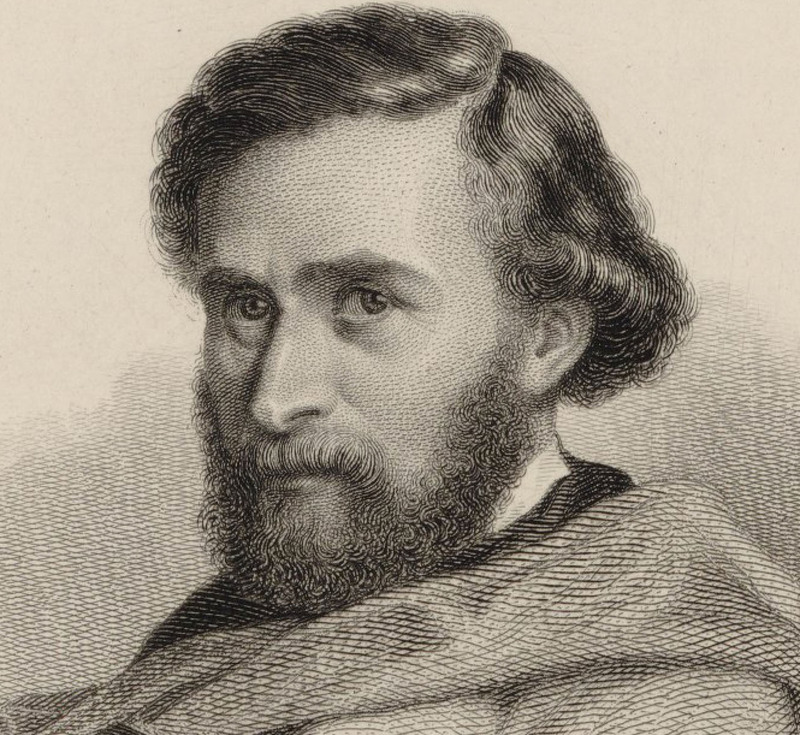 Excelsior (1841), a classical poem, by the American Henry Wadsworth Longfellow (1807-1882) was set to music dozens of times. The cover above illustrates the music for the poem composed by John Blockley. Excelsior is the most parodied of all Longfellows poems, being almost a parody of itself. The theme of the poem is punishment for human hubris or excessive pride. 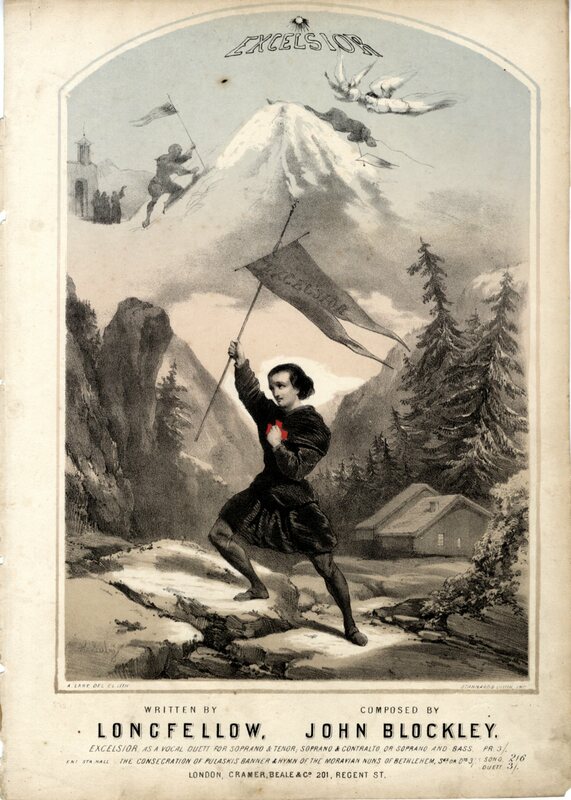 A boy, bearing a banner ‘Excelsior’, wants to climb higher and higher in the Alps. He ignores all warnings from the local villagers and ends up dead. 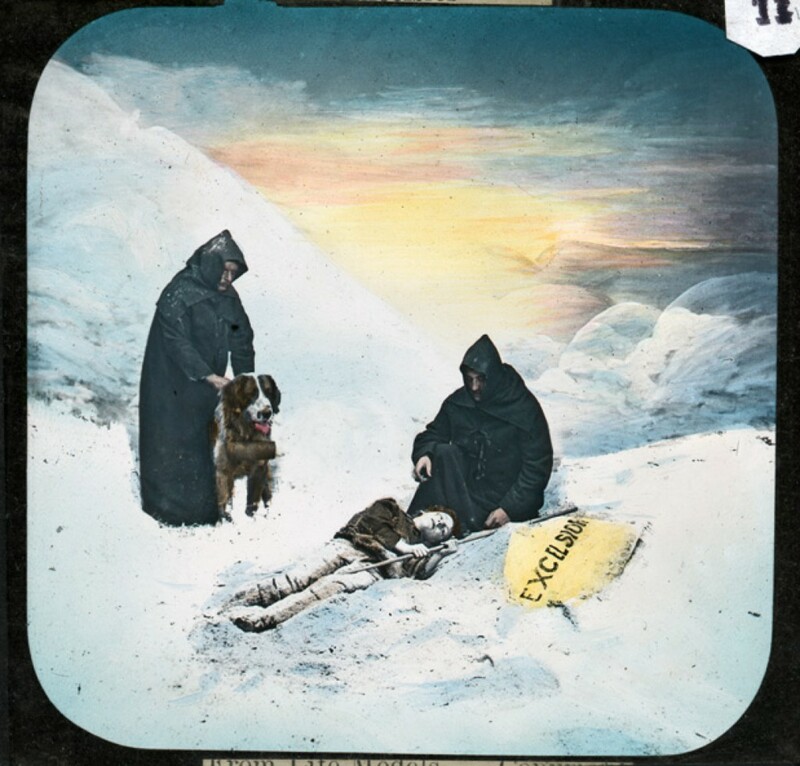 Half-buried in the snow he is found by a St. Bernard and some monks. 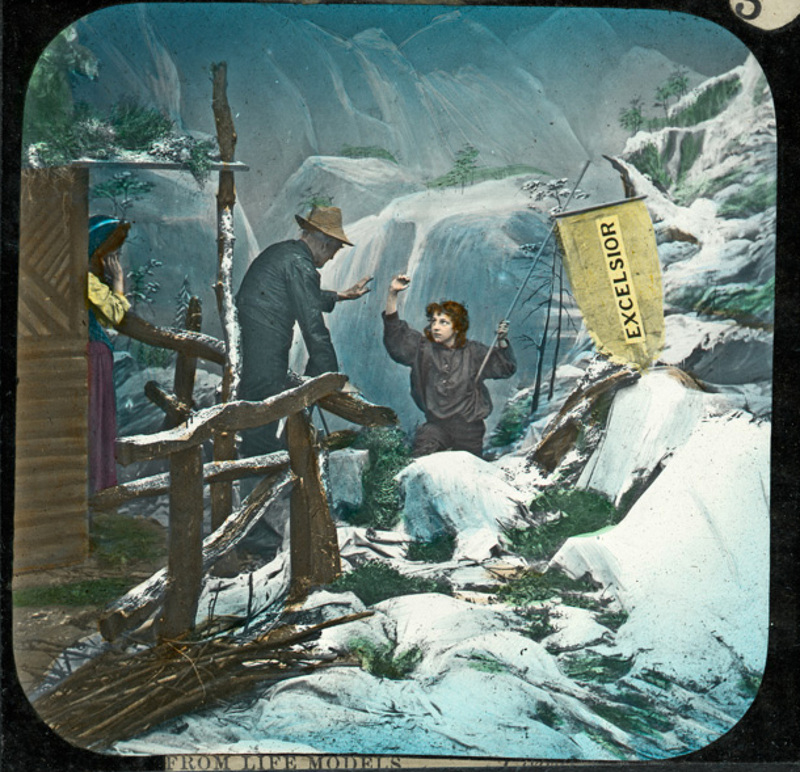 Excelsior was also illustrated for the magic lantern. We found the images of the slides hereunder on Laterna magica’s website. The projection of slides during a singing performance led to a new, often lucrative business of producing these ‘illustrated songs‘ (1). 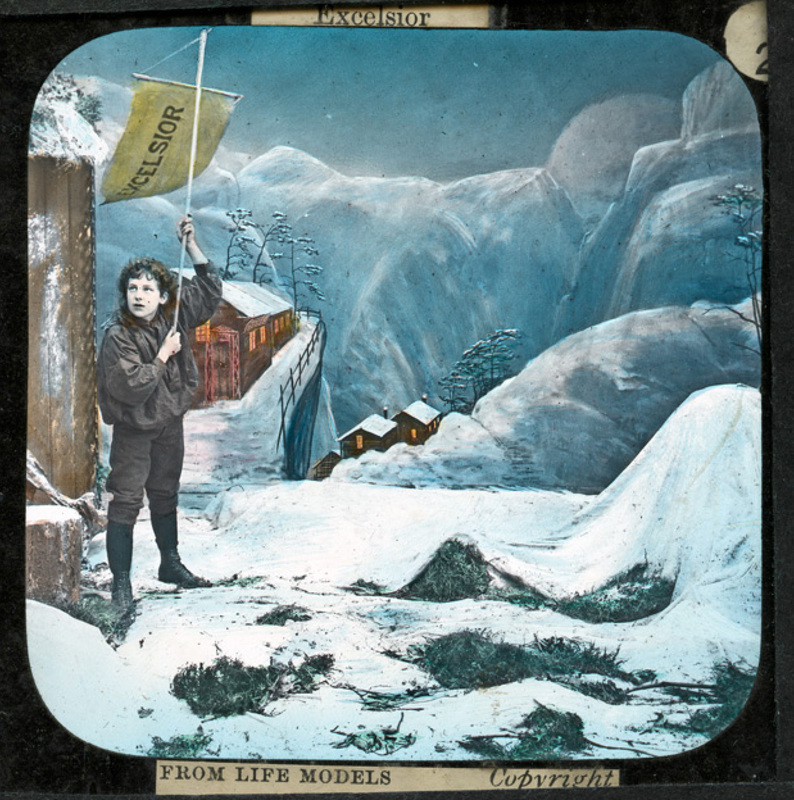 These slides were remarkable because they were handcoloured photographs made of real life models and decors constructed in a studio. These slides immediately preceded cinema. La Lionne de Mabille: trendsetter or courtisane? We were intrigued by this cover because the drawing of the elegant young lady is at odds with the title ‘La lionne de Mabille‘. So we did some research into the meaning of the french word lionne. During the first half of the 19th century, the word lionne, French for lioness, was used to designate a young, eccentric, cultivated but romantic Parisian woman of means with an independent spirit. A lionne was a trendsetter in fashion and in thoughts, without being a feminist. There existed lionnes littéraires and lionnes politiques. 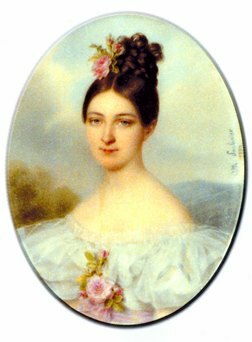 The term is extensively described in the 1845 booklet ‘Les Lionnes de Paris’ written by the Cuban born Maria de las Mercedes Santa Cruz y Montalvo, known after her marriage in 1811 to a French aristocrat as La Comtesse Merlin. La Comtesse Merlin can herself be considered a first rate lionne. She was keeping a literary salon in Paris where people gathered to refine their taste and increase their knowledge through conversation. Her beauty and her charm attracted le tout Paris. La Fayette, Chateaubriand, George Sand, Mérimée, Balzac and de Musset were amongst her guests. 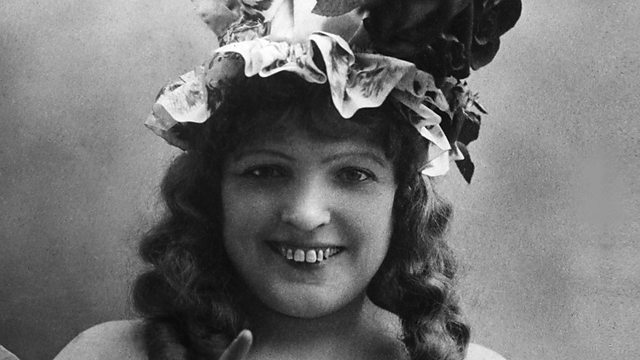 According to others une lionne was used to describe a courtesan. In French you have a lot of terms for describing a kept woman: cocotte, grande horizontale, demi-mondaine, demi-castor, biche, lorette, gigolette, grisette, fille… like the large number of Eskimo words for snow. In either case les lionnes frequented the Parisian ballrooms. 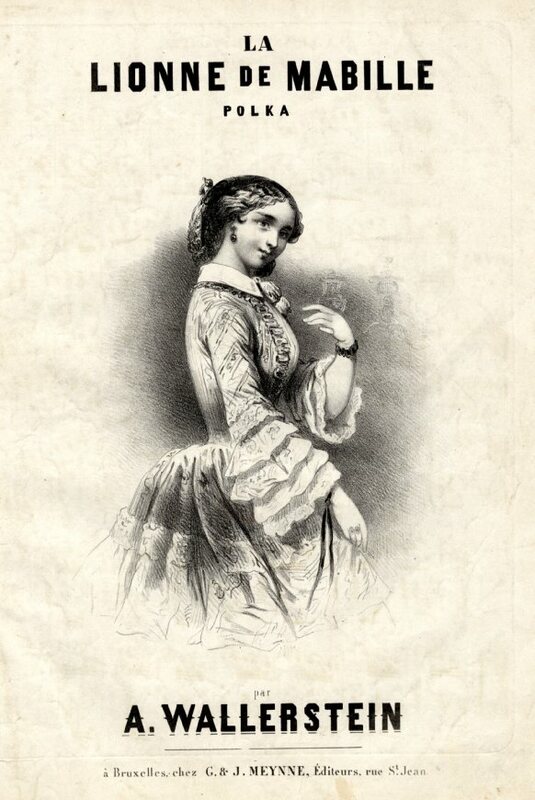 And one of these was the Bal Mabille founded by a Parisian dance teacher, Monsieur Mabille. 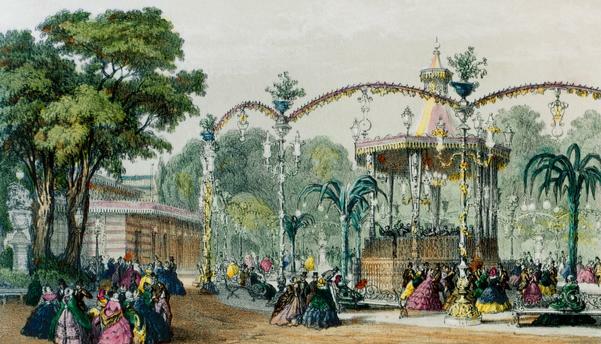 At the start in 1830 it was an ordinary guinguette near the Champs Elysées. The Champs Elysées was not the busy road it is now but was still very much the countryside. Monsieur Mabille’s sons introduced 3000 gaslights in 1843. Lacking age-old oak trees in the garden, they planted iron palm trees speckled with colourful lamps. They arranged fake flowerbeds and a grotto. A dozen giant poles were connected by fairy lights. Moorish pavilions were erected to house the orchestra and the grand café. This fairy-tale landscape could best be admired by night which led to the brothers’ brilliant idea: they opened the first bal champêtre by night. It proved a huge success and was copied everywhere. The Bal Mabille was a triumph of modernity and exoticism and was only affordable for the happy few, at least in the beginning. Later on it became more mainstream and in the 1860s lost its charm for the women of the upper and even middle classes. In 1870 Le Bal Mabille definitely closed its doors. 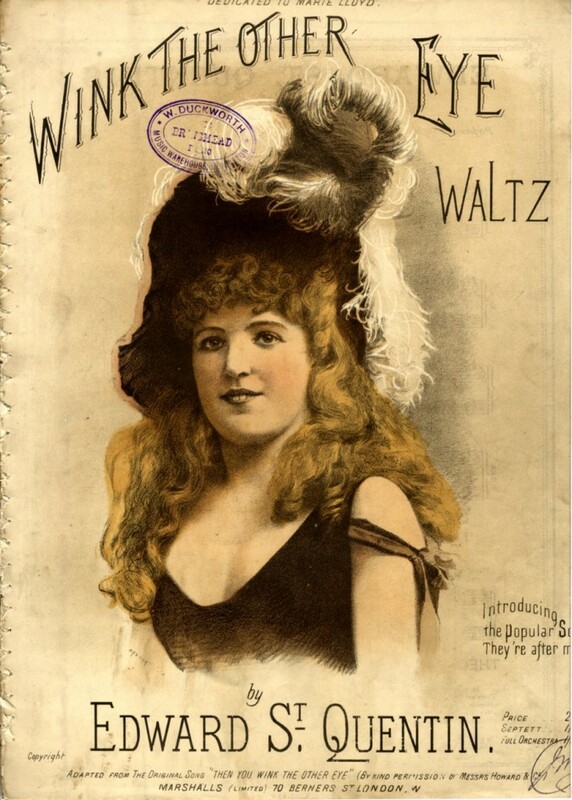 The polka La Lionne de Mabille was composed by Anton Wallerstein a German violinist, and prolific writer of popular dance music with international acclaim. The polka, became very popular as a new dance style and some claim that is was danced for the first time in France in Le Bal Mabille. That this song was published in Belgium indicates that it was popular outside France. Ina Boudier-Bakker, a well known Dutch writer let her main character Annetje in De klop op de deur (The Knock on the Door) play La Lionne de Mabille on her piano.